Looks great! I that the original paint? I love return-to-stockish rebuilds. In fact, I have one going now so this is some good inspiration. Lookin good man im in the same boat fixing PO hack jobs right now. Except on an FB lol. Thanks guys, I really appreciate the feedback. I'm coming up on a year and looking at it compared to when I first got it is shocking how much has been fixed up. Still plenty more though. Once she's running with the fixed drivetrain I'm going to start sourcing parts for the replacement engine so that when mine decides to go, I don't have to worry about it. This is definitely a restoration build as far as mechanical goes, and I love the stock interior look so I need that head unit. The exterior though appeals to the JDM guys, and I like it. Many hours have already gone into this build, now I just need more money! So, another big update. I ended up getting my stock injectors reman. 'd, and back just in time for 2 days before the cruise. We got to start up the car and she runs! However, in typical RX7 fashion the drama wasn't over. The temp gauge was about 2/3 up and I knew on the S4 gauge that that was way too high. So, we touched the top of the rad. and one side was cold and the other was boiling hot. Yup, needed a new rad. Steve lent me his rad. out of his old 10AE, so basically my car is turning into 10AE Jr. at this point as I keep pillaging more and more parts from it. Needless to say, I got my day permits and it was a success! The meet went great, and the turnout was ridiculous. I'll let the pictures do the talking. The meet went great, I'd assume around 20-30 cars. Even some skylines showed up too. We cruised for about 3 hours all the way up to Harrison Hot Springs, then to Cultus Lake. All in all a great day as it was my first cruise. There were even a few cars that came up from Seattle, great guys too. - Idle (Won't idle under 1500, won't idle on it's own when cold, yada yada). - Driver's Seat bolt was stripped so the seat is leaning on its own. I went to ICBC and they wouldn't let me put my 3-month permit on because the car needs Aircare. So, I needed to bolt in the cat that I had been given just for the one day every year that it gets tested. 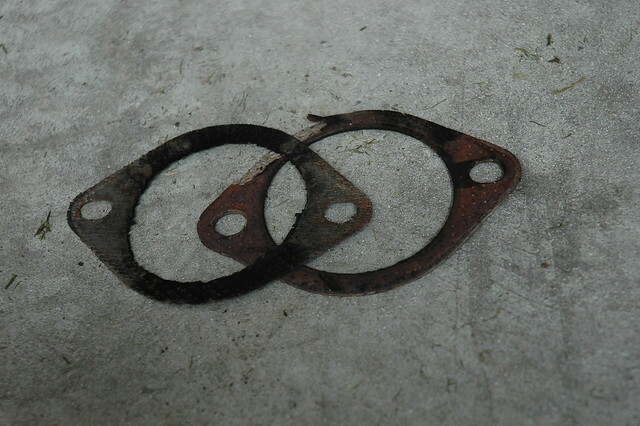 I threw that in only to find that the old racing beat gaskets had been burnt to a crisp. This resulted in me trying to bolt the cat in regardless and me having a huuge exhaust leak (as expected). 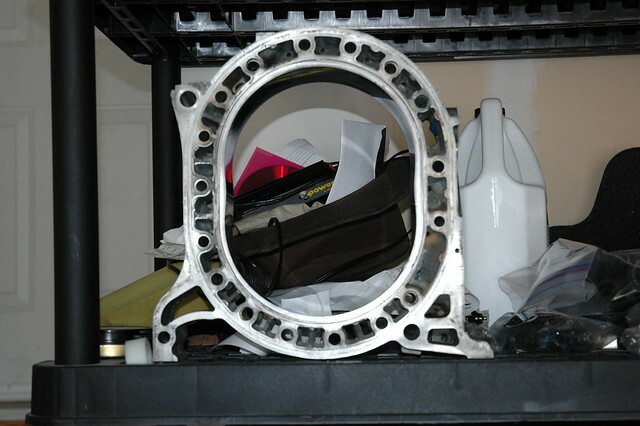 So, I'm working on getting those gaskets soon to rectify this and finally pass aircare. Hopefully this week it'll finally be over with. Racing Beat Midpipe out, cat. in. Next thing, idle. I went over to Steves and picked up a nice low-mileage throttle body that had all the old accelerated warmup stuff on it! The previous owner had absolutely stripped everything off the old one.. nice. Needless to say, I have a perfect 750 idle now and when i turn the key i don't have to pump the throttle to keep her alive. EXTREMELY happy with this now. Things like that really bug me. Also picked up a nice clean stock intercooler with the rubber grommets and the right mounting bolts, cleans it up a bit. The old one looked like it was just thrown around the garage a few times, maybe the garburator once or twice. Needless to say, I'm happy. Still working on that pesky driver's seat issue. The threading nut will have to be re-welded on and a new bolt in. Last edited by 7speed; 07-25-12 at 10:50 AM. Really cool thread you're updating here, keep it up! Great job so far! How're you liking the Racing Beat exhaust? Thanks everyone. 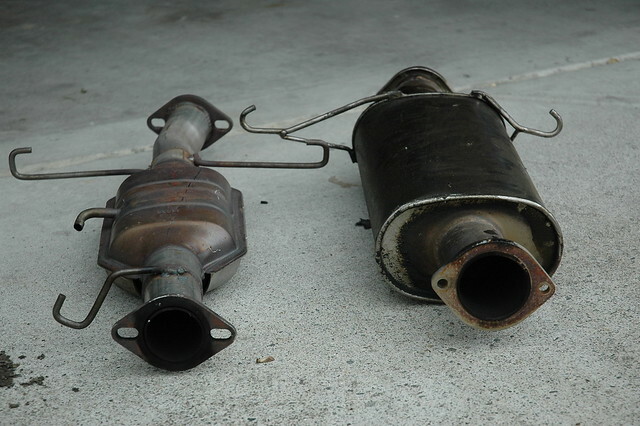 Umm, the Racing Beat exhaust is great just too quiet. I like how it's very civil and doesn't bother the neighbors but it needs a bit more noise. Within the next few months I'm having that midpipe taken out and getting just an unrestricted pipe to go in it's place. It should sound perfect then. With the power improvement, the Racing Beat kit should be a no brainer. Small update. I noticed that this little guy was in the scrap bin so I grabbed it from Steve's as a nice mantle piece. It isn't usable but I decided to clean it up and put it in the garage. A nice piece of history and it really is a beautiful piece of art. Out of a '79 Cosmo too so it's seen some ****. Next, this compartment will finally be complete. I've been scouring the web for a stock head unit, particularly the Pioneer CD one for months (since I purchased the vehicle). I found it on Portland craigslist and the owner had bad experiences with shipping and refused to ship it to me. He wanted to meet up halfway or just flat out me drive to Portland. So, I scrapped that idea and just moved on. Fast forward 6 months and I noticed that the same unit was still on craigslist and emailed Tim again. He finally gave in and it is now airborne and should arrive within the next 5-10. 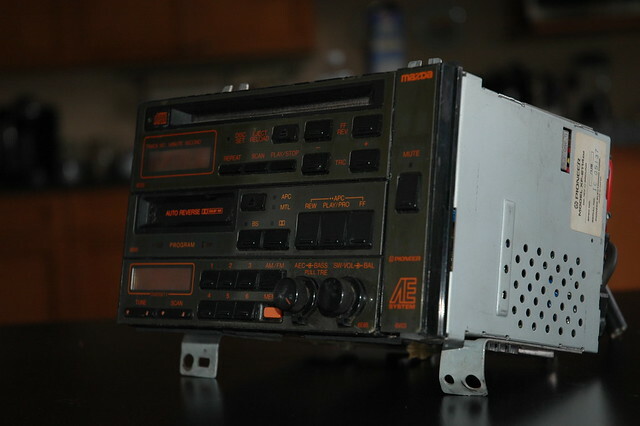 It will likely be fully refurbished and have the aux. input installed. 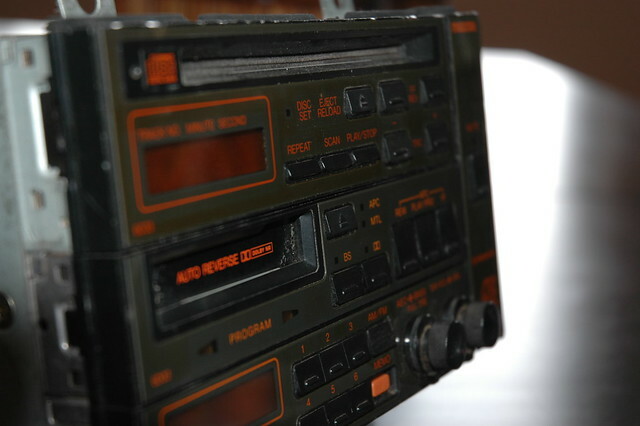 I have read good things about Factory Radio Service, so it will be sent there for the handywork. I can't wait! I also conditioned the leather as it was very brittle/ tough. Came out nicely, but it'll still be a few more coats before it's to where I'd like it. It is 24 years old after all. I also have more big news but it'll have to wait until I get paid. So, two days and two big updates. I've been searching everywhere for the specific Pioneer premium head unit that came with the convertible RX7's for about as long as I've owned the car (almost a year now). Finally found one right around January that was located in Portland. The guy didn't want to ship. Lame. So, I continued looking half-assed while just casually browsing like I normally do. Anyways, I noticed about a month ago that this deck was still for sale in Portland so I figured the same guy an email telling him the same thing I did 6 months ago and he finally gave in. It cost me a small fortune for what is basically an autowreckers special. Nevertheless I finally have a head unit and the PO told me that it had been their spare one and was told upon buying it that it was as-is and had never been tested. Yikes. Desperate times.. So, I still went ahead with it and it finally arrived in the mail 2 days ago. 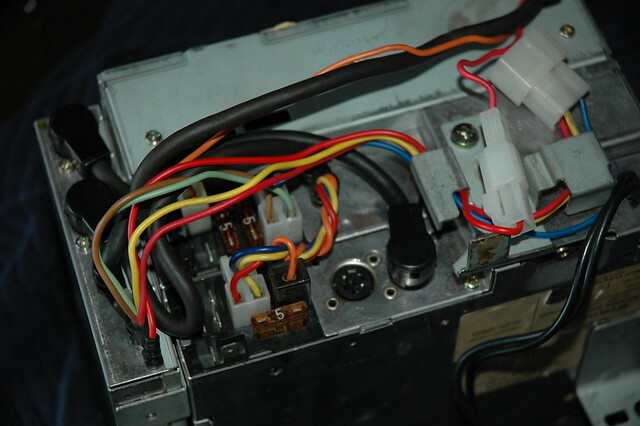 I took it apart and cleaned it and all that jazz but it was still heavily faded and upon plugging it in, the CD player accepts CD's but the lens is pooched so I'll have to send it in to factory radio service, which I was planning to do anyways. I'll have them put in a aux. input so I can use my iPod. This is a bigger one and one that I've wanted for a long long time. 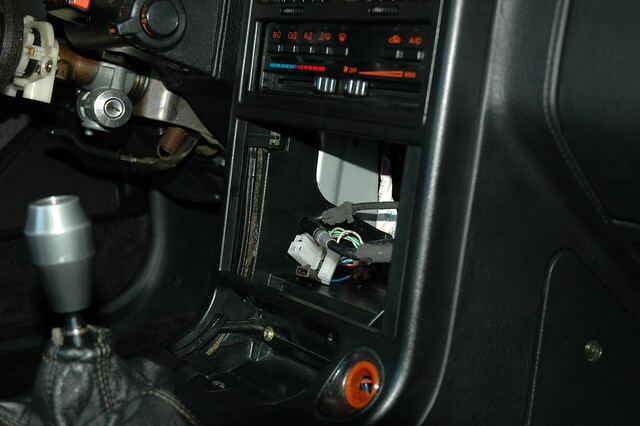 Similar situation to the head unit. Going way back to winter last year an FB popped up at Steve's house. 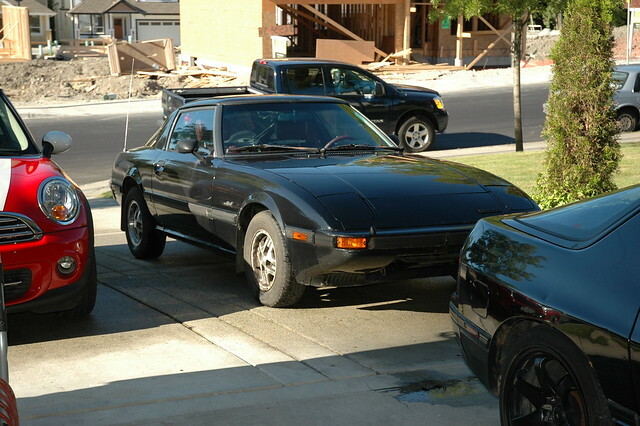 He was selling it, but was unsure of condition, had been sitting for a long time and all that usual stuff that goes along with a 28 year old car. Anyways, it always caught my eye. I just love the old FB body and one day I'd really like to restore one. I always joked about how I wanted to buy the car and that it would be mine someday. Fast forward, the summer came along and hours got better and the FB was still there. Soo, I got the money together and then we tried to fire it up because it had been about 8 months. No go. Compression is wonky as well but that will be taken care of next summer, I plan to tear it down and just do a ghetto build on it. 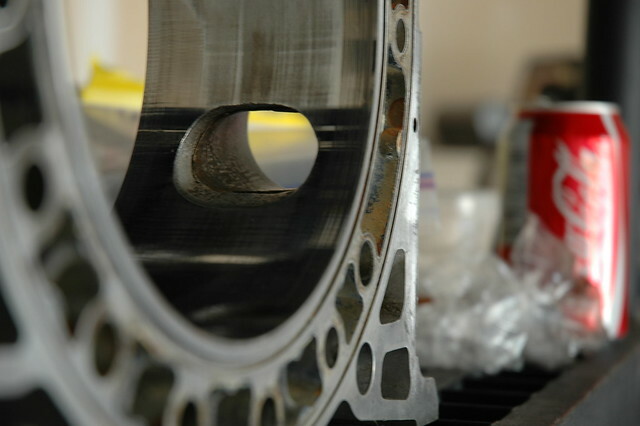 Clean up the housings and replace all the seals and gaskets. So, we started it and it wouldn't start. Carburetor was messed up. I hadn't even purchased the car yet and I went out and found a carburetor on craigslist the very next day for $100. It was from an '82 (this car's an '84) and Steve said that they were different but it would still work. So, even though this carb I bought was in completely unknown condition and hadn't been used in years, I took the leap of faith and we threw it in. Perfect! The car idles and runs like a dream. About a month or so later I saved up the money again because I had spent the previous amount on the T2, and I finally bought the old girl. 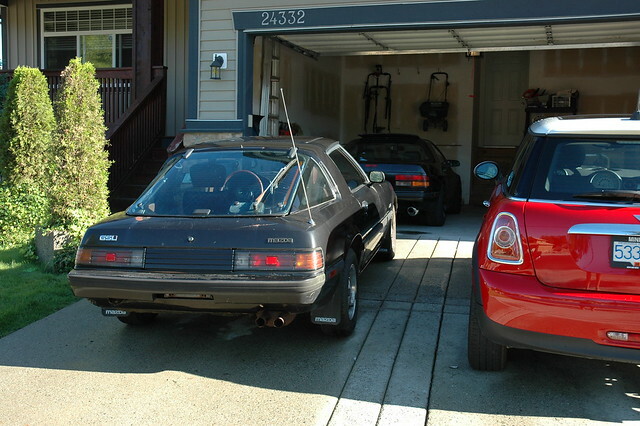 Also, having two RX7's now I had to name them. I came up with Smokie, and 2.0. Smokie is because the T2 has an oil leak that runs onto the exhaust causing it to smoke up any intersection or parking stall, and 2.0 is the '84. Enough rambling, here's the pictures. 2.0's getting a full stainless exhaust but that's it. It's just reserved for winter duties because she's pretty rusty. Smokie still needs plenty of love, so that's still priority number 1.
congrats on your first build iam also on my first build FC t2 s5 with chain bride and s4 rotors for more boost. I don't skimp out on buying cheap eBay stuff either. It just takes time to buy the right stuff the first time, so bear with me. Great thread. Love the wheels and the seats - so hard to find a decent interior. Thanks everyone, much appreciated. I've shut the FC down for Autumn/ Winter so first on the list is a Koyo Rad and a properly working Trans and Clutch. That's what I'm hoping to have done by Spring. That pesky oil leak as well needs to be solved. I love the FB so much I'm doing my best to keep all the money just going to the FC. Builds usually get more intense during fall/winter i thought? Well fore at least, but See you next season then bro! 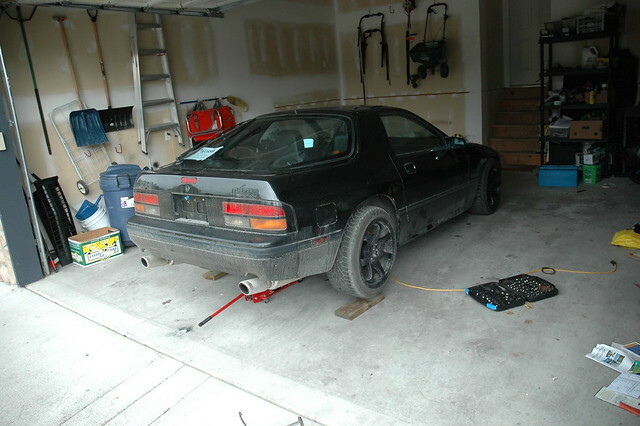 Umm, well I figure that now I have a 2nd car I can finally do the things that I wanted to all year because the FC can be taken off the road for extended periods of time. FB will be being refreshed as well in the coming spring. wow ! Your car is clean !! I'm super excited to start wrenching on her again. It's been awhile to say the least. Nice build! I'm on my iPhone so I for get the side bar for location, where you located? Noticed ICBC and air care. My favorite company to deal with eh! Luckily up north we don't have air care! Glad to see it coming along! Oh man, I've already got my fair share of ICBC stories. But, I don't have a choice (thanks socialist government) so I just have to swallow it and pay the man. Thanks for the compliments, I'm in Maple Ridge in the mainland. We're talking about having a meet in the near future, if we do you should come down! If my car is running, I'm having issues with spark and can't figure it out at all. But if it runs ill try and come, I only have one other member who lives in Prince George with me (import fanatic) who has been a tremendous help but we still haven't solved it! Hopefully both of us can come down though!